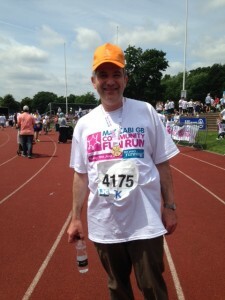 Last Sunday 19th June I took part in the Maccabi Fun Run to raise money for Tribe and for youth projects at our Shul. I am very grateful to all those members who kindly sponsored me. The run I participated in was the shortest, just 1km, but it involved being tied to another rabbi, Rabbi Alan Garber of Shenley United Synagogue. Various other US rabbinic colleagues were running similarly tied. Poor Rabbi Garber was wearing shorts and after about half the distance the rope was hurting his legs, so we ditched the rope and ran the rest properly. It brought back happy memories as my previous run on that track (Copthall Stadium as it was then known) was the 800 meters for my House at Hasmonean School Sports Day some time in the late 1970s. I came second out of eight runners, which was the only sporting “achievement” of my entire school and university career (and indeed ever since). The atmosphere at the Fun Run on Sunday was lovely – a real buzz with many people running for many different worthy causes. To support this great cause donate here!